The Canadian government pursued this policy of cultural genocide because it wished to divest itself of its legal and financial obligations to Aboriginal people and gain control over their land and resources. If every Aboriginal person had been “absorbed into the body politic,” there would be no reserves, no Treaties, and no Aboriginal rights. Roman Catholic, Anglican, United, Methodist, and Presbyterian churches were the major denominations involved in the administration of the residential school system. 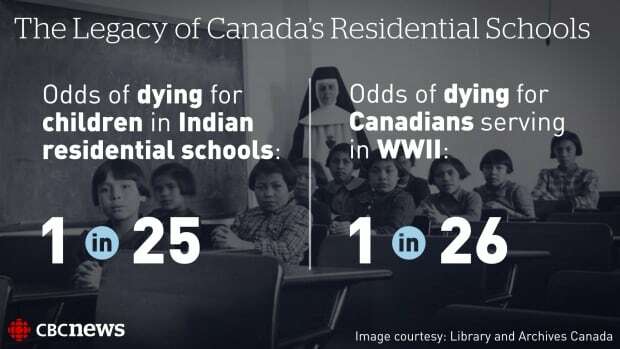 The government’s partnership with the churches remained in place until 1969, and, although most of the schools had closed by the 1980s, the last federally supported residential schools remained in operation until the late 1990s…. In establishing residential schools, the Canadian government essentially declared Aboriginal people to be unfit parents. Aboriginal parents were labelled as being indifferent to the future of their children—a judgment contradicted by the fact that parents often kept their children out of schools because they saw those schools, quite accurately, as dangerous and harsh institutions that sought to raise their children in alien ways. Once in the schools, brothers and sisters were kept apart, and the government and churches even arranged marriages for students after they finished their education. The residential school system was based on an assumption that European civilization and Christian religions were superior to Aboriginal culture, which was seen as being savage and brutal. Government officials also were insistent that children be discouraged—and often prohibited—from speaking their own languages. The missionaries who ran the schools played prominent roles in the church-led campaigns to ban Aboriginal spiritual practices such as the Potlatch and the Sun Dance (more properly called the “Thirst Dance”), and to end traditional Aboriginal marriage practices. Although, in most of their official pronouncements, government and church officials took the position that Aboriginal people could be civilized, it is clear that many believed that Aboriginal culture was inherently inferior…. Truth and Reconciliation Commission of Canada (TRC). The Survivors acted with courage and determination. We should do no less. It is time to commit to a process of reconciliation. By establishing a new and respectful relationship, we restore what must be restored, repair what must be repaired, and return what must be returned…. In its 2012 Interim Report, the TRC recommended that federal, provincial, and territorial governments, and all parties to the Settlement Agreement, undertake to meet and explore the United Nations Declaration on the Rights of Indigenous Peoples, as a framework for reconciliation in Canada. We remain convinced that the United Nations Declaration provides the necessary principles, norms, and standards for reconciliation to flourish in twenty-first-century Canada. A reconciliation framework is one in which Canada’s political and legal systems, educational and religious institutions, the corporate sector and civic society function in ways that are consistent with the principles set out in the United Nations Declaration on the Rights of Indigenous Peoples, which Canada has endorsed. Together, Canadians must do more than just talk about reconciliation; we must learn how to practise reconciliation in our everyday lives—within ourselves and our families, and in our communities, governments, places of worship, schools, and workplaces. To do so constructively, Canadians must remain committed to the ongoing work of establishing and maintaining respectful relationships. For many Survivors and their families, this commitment is foremost about healing themselves, their communities, and nations, in ways that revitalize individuals as well as Indigenous cultures, languages, spirituality, laws, and governance systems. For governments, building a respectful relationship involves dismantling a centuries-old political and bureaucratic culture in which, all too often, policies and programs are still based on failed notions of assimilation. For churches, demonstrating long-term commitment requires atoning for actions within the residential schools, respecting Indigenous spirituality, and supporting Indigenous peoples’ struggles for justice and equity. Schools must teach history in ways that foster mutual respect, empathy, and engagement. All Canadian children and youth deserve to know Canada’s honest history, including what happened in the residential schools, and to appreciate the rich history and knowledge of Indigenous nations who continue to make such a strong contribution to Canada, including our very name and collective identity as a country. For Canadians from all walks of life, reconciliation offers a new way of living together…. Truth and Reconciliation Commission of Canada, It’s Time for Reconciliation, Ottawa, May 31-June 3, 2015.